Our famous pocket-size eyebrow kit is NEW & improved! Brow zings' perfectly paired eyebrow powder & wax, mini slant tweezers and NEW dual-sided extendable applicator is everything you need to sculpt, shape and fill brows. Plus, our signature Tips & Tricks! Available in 3 NEW shades so every gal can get amaZING brows. 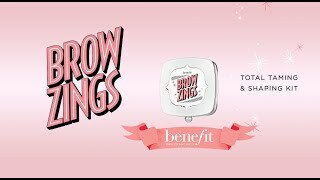 How will Brow Zings transform your look? See for yourself...with our new virtual Brow Try-On! Check out the product payoff on your brows and find your perfect shade. Brow Zings used to only have 3 shades – which ones are the existing and new shades? And how are they similar or different? Hi gorgeous! The new shades are #1, #3 and #5, they are more neutral shades. Nothing else in the formula has changed. The shades #2, #4, and #5 are the same as the original light, medium, dark Brow Zings! Now you can get amaZING brows!